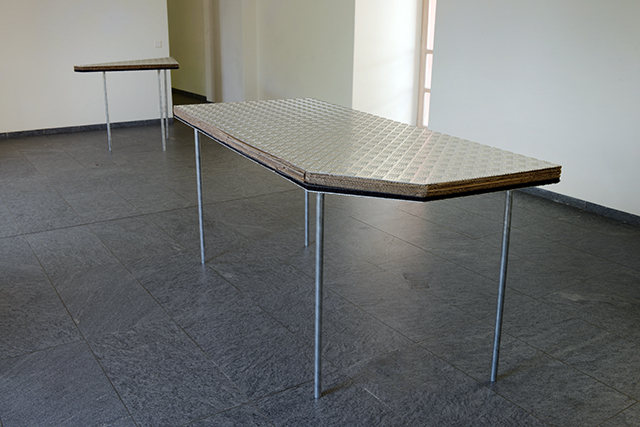 The tables act in the exhibition space as a sculptural reference to the real space. Consisting of irregular shapes and multiple overlapped layers, born from urban founding objects – an office dark carpet, cropped and discarded in the trash in Zurich, the metal flooring typical of the industrial platforms, cardboards founded in the streets –, the tables can be converted from aesthetic household objects to a no-functional object in the translated space, the product of a visual suggestion, originated by crossing the city and by experiencing its social limits. The translation of forms and layers describes the attempt of a spatial reconstruction of the object, passing through the sculptural de-construction and moving the point of view.